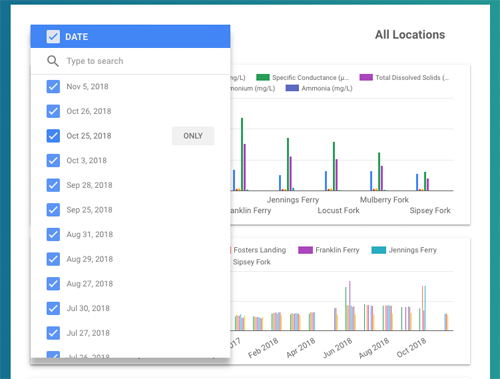 As well, the entire dataset can be downloaded as a spreadsheet or explored in Google Data Studio, a tool designed to streamline the editing, viewing and data visualization experience. You can read more about Data Studio here. If you have an questions or comments about the collection of data or the data itself, please email John Kinney or call the Black Warrior Riverkeeper office to reach him. If you have technical questions or bug reports, please email Baird Castleberry.